IRBIL, Iraq -- A car bomb exploded outside the U.S. Consulate in the northern Iraqi city of Erbil, the capital of the Kurdish autonomy zone. Iraqi police officials said three people were killed and five were wounded in the bombing. One American teacher and two Turkish citizens were among the wounded, police said. U.S. officials said there were no American casualties or casualties among consulate personnel or guards. 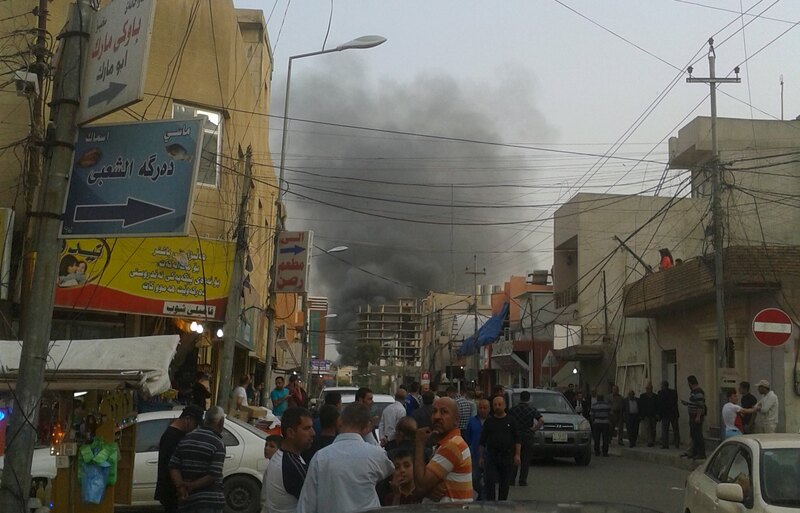 An Associated Press reporter at the scene said the powerful blast went off outside a cafe next to the building in Irbil's Ankawa neighborhood, setting several nearby cars on fire. Shortly afterward, the Islamic State of Iraq and Syria (ISIS) claimed responsibility for the Irbil attack, reported the SITE Intelligence Group, which tracks militant websites. Hiwa Afandi, a Kurdish government official, tweeted that the blast was the result of a "failed" attack on the consulate, claiming that guards confronted the bomber who detonated the device before reaching the consulate. Meanwhile, in Baghdad, a series of bombings ripped through the city on Friday, mainly targeting public places and killing at least 40 people, Iraqi officials said. No group claimed responsibility for the latest attacks, though ISIS has taken credit for similar attacks in the past, especially those targeting Shiites, as well as Iraqi security forces and government buildings.